This is sort of a wonder product in the sense that one can colour one’s hair without any chemicals. Our product is the result of an extraordinary combination of ancient Ayurvedic and modern techniques that balances the wonders of nature to support healthy lifestyles.This traditional freshly ground blend of various herbal ingredients when mixed with water dissolves into a luxurious paste and nourishes and enlightens hair with rich colour, imparting shine and silkiness.Our product does not contain any of the harmful chemicals used in liquid and other powder colours. It has no PPD, Ammonia, Peroxide, Resorcinol, heavy metals and Parabens. These chemicals tend to manipulate the melanin of the hair thereby damaging the structure of the hair, permanently rendering it brittle, fragile and lusterless. 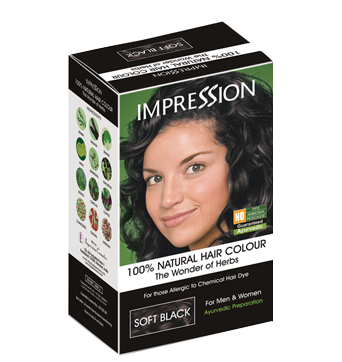 Impression 100% Natural Chemical Free hair colour has no synthetic ingredients, not even a single preservative. It contains herbs grown in the Himalayan region which have been known to humans for over centuries and traditionally been used for dyeing of hair. No other organization in the world can claim to produce this product as these herbs are unique to India. We are counted among the leading manufacturers, suppliers, wholesalers and exporters of excellent quality Hair Henna Natural Brown. No PPD, Ammonia, Peroxide, Resorcinol, heavy metals or Parabens. 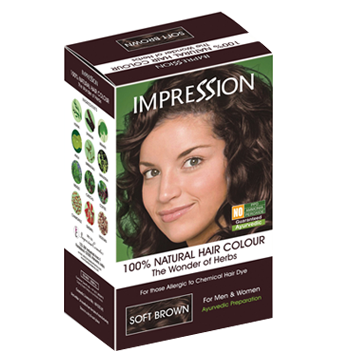 Impression 100% Natural Herbal hair colour has no synthetic ingredients, not even a single preservative. Neel Patti (Indigofera Tinctoria):- This colouring plant is an oxidizing herb, lends depth to your hair colour, leaving it shiny & bright. Amla(Emblica Officinalis):- This plant is rich in vitamin C which helps to build resistance to dandruff. Shikakai (Accacia Concina):- Used for its deep cleansing action and as an astringent and antibacterial agent. Brahmi (Baccopa Monnieri):- Most potent herb for enhancing scalp corpuscles. Henna (Mehndi):- A natural dye which penetrates the surface of the cuticle and settles on the thread, creating a layer that gives hair more strength and shine. Inderjau (Holarrhena Pubescus):- Special acting antioxidant and moisturizer. Gurhal (Hibiscus):-Prevents hair problems like split ends, dandruff, dryness, dullness and also also adds volume to hair. Coffee (Coffea Arabica):- A natural dye which imparts brown tinge to the hair and creates shine and strength. Chamomilla (Chamomilla Recutita):-An anti-inflammatory, anti-bacterial and anti-allergenic herb. 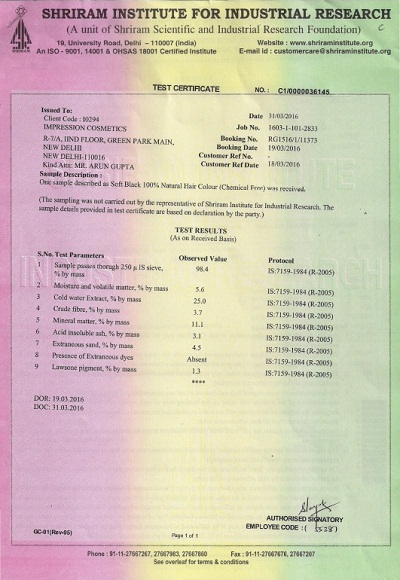 Why Impression 100% Natural Chemical Free Colours? Take out the Impression 100% Natural Chemical Free Hair colour in a plastic bowl, add boiling water (approx. 3-4 times to powder quantity) to make thick paste. Wash your hair with shampoo to remove oil and dust from the hair and dry them with towel leaving some moisture. Apply the paste with a brush on your hair, dividing hair into segments. Start from the roots of hair and work gently through every part of hair. Pile up hair on top of your head. After applying this paste cover your hair with shower cap provided in the pack. Let the mixture remain on the hair for one hour or more (more the better). Apply heat all over your hair with a blow dryer with shower cap on. Wash the hair in natural water. Keep your eyes and mouth closed while washing your hair. Actual colour will appear after 48 hours of application. 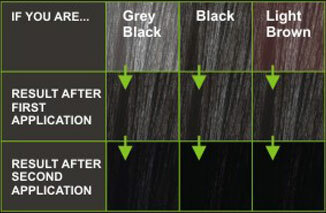 If you have more than 20% gray hair, actual colour will appear after 2 applications. First time users, advised to repeat within 2 days of first application. Do not oil your hair for next 48 hours. Avoid shampoo for next 48 hours. Avoid covering your hair with a cap or scarf for next 48 hours. If your hair is lengthy or full, we advise using more than one pack. When certain health conscious people, found themselves overexposed to the use of chemicals in their daily lives, with long term disastrous effects, it led to the search for traditional and time-tested techniques which were connected to nature and at the same time supportive of modern and fashionable lifestyles. As a result, herbal products came into existence to fulfill this need. Impression 100% Natural Chemical Free Hair Colour caters to these select groups of people who believe in nature and want to avoid the long term ill effects of sustained use of chemicals.